Finally, after months of rumors and speculation, Apple lifted the veil on its lineup of new iPhones on Wednesday. The iPhone Xs, iPhone Xs Max, and iPhone Xr are the company's latest handsets and come loaded with upgrades and new features. Comparing the new iterations of iPhone to last year's should present several questions, however. Are the differences in battery storage, size, LCD vs OLED- screens and all the colors meaningful enough to justify dropping hundreds, if not a thousand dollars to upgrade? We took a close look at some of the most important features that set each of the available iPhones apart, including storage sizes, prices, display sizes, battery life estimates, camera specifications and more. Of course, these aren't the only things you should consider when shopping for a device you'll be attached to for at least the next year, but these details should serve as a good start. With any luck, you'll have your mind made up before pre-orders begin. Storage & Prices: 64GB, 256GB, and 512GB starting at $999 for 64GB. Battery Life: Up to 30 minutes longer than iPhone X, according to the company. Display Size: 5.8-inch OLED display. Camera Specs: Dual-lens 12 megapixel, wide-angel camera and a 12 megapixel, telephoto camera. It's equipped with a "Smart HDR" that automatically takes multiple images and combines them to create excellent exposure. The company calls it a "new era of photography." Front-Facing Camera Specs: TrueDepth camera with advanced FaceID. Color Options: Silver, space gray, gold. Storage & Prices: 64GB, 256GB, 512GB, starting at $1099 for 64GB. Battery Life: Up to 90 minutes longer than iPhone X, according to the company. 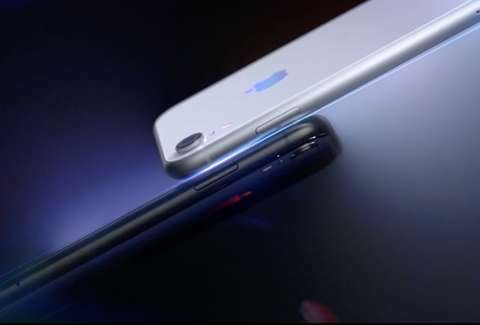 Display Size: 6.5-inch OLED display, which is "the largest display ever on an iPhone," per Apple. Camera Specs: Dual-lens 12 megapixel, wide-angel camera and a 12 megapixel, telephoto camera. It's equipped with a "Smart HDR" that automatically takes multiple images and combines them to create excellent exposure. The company says its TrueDepth camera system is ushering in a "new era of photography." Front-Facing Camera Specs: TrueDepth camera with advanced FaceID, in addition to 4K video and a slew of other specs. Storage & Prices: 64GB, 128GB, 256GB, starting at $749 for 64GB. Camera Specs: Single-lens 12 megapixel, wide-angle and TrueDepth camera system similar to the iPhone Xs and Xs Max. Color Options: Black, white, red, yellow, coral, blue. Storage & Prices: No longer available. Check back for more updates on everything you need to know about Apple’s 2018 iPhone announcements, including the differences between all three new iPhones, the new color options, when you can pre-order them, how much they’ll cost, the new iPhone sizes, info about iOS12 and more.